This unit allows you to connect a variety of Internet sources. In our case right now we have two wifi antennae: Verizon 3G and AT&T 3G connections, as shown in the first graphic. We are still at Jarrett Bay, near Beaufort, North Carolina, and the cell signals are weak and slow. The Jarrett Bay wifi signals are usually somewhat better. All four of the sources are available, as shown here. Each time there is a new Internet event, a different batch of data at a new URL is addressed, the Pepwave software “pings” the various sources, and selects the fastest from those available under priority. This is a Sunday evening speed test of the wifi signal, much faster than we would see with our old system. Note here that the two cell signals are under the priority two category, and are shown in standby mode. Should the first priority modes drop below preset quality, then the priority two source(s) kicks in. This way you might have the costly data on the cell for when wifi was too slow or unavailable. And if there is sat com aboard, it might be disabled most of the time, but brought online in standby mode when you absolutely had to have reliable communications. The Pepwave software allows you to set up rules for who gets to do what and how different sources are assigned. For example, sat com might be reserved for certain users (those who write the checks) and only for e-mail. Wifi might be used by everyone, and cell for just the owners. We have not yet tried to set up these rules, but Pepwave has good tech support and we are told that, with a little hand-holding, even Luddites like us can work through this. Right now the default rule is to allow all users all sources, and to check for fastest available connection each session. There is a bandwidth monitor, showing the data usage on each available channel. Here we are downloading a photo from our photo server as a test. This is coming in over the wifi WAN port on the first antennae connected to Jarrett Bay. There is also data coming in over the Verizon 3G connection (bottom graph). There are accumulators available for the various channels, and settings to let the user know to change sources when certain levels have been reached, so as to avoid overage charges. The Pepwave system comes with six little antennae, two for cell, two for the LAN (your personal wifi network) and two for WAN wifi. Plus you can connect sat com and cable modems, and there is a plug for a USB cell phone system modem. These will work, and we started out with these, but for best cruising results you will want external antennae. This is an area in which we have not found a single, reliable source of information, and we are hopeful that some our our SetSail visitors will have input on this subject. What we’ve ended up with is a pair of external cell phone antennae (unpowered). And then, after much messing about, a pair of Rogue Wave units for wifi. The Rogue Waves use a power over Ethernet (POE) amplifier and Ethernet cable, so line loss and distance from the router are not the problem they would otherwise be. To choose a wifi signal, the Rogue Wave antenna in question is addressed through its URL, all of which goes through the Pepwave router. 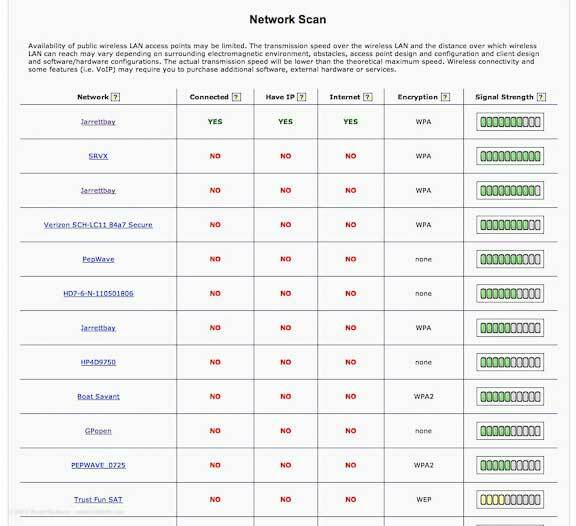 The page above magically appears, showing a selection of wifi signals from which to choose. This process involves moving all the connections except the Rogue Wave antennae to the disabled list, tying in the URL, and selecting the wifi source. It sounds complicated, but in reality is quite simple, and is something that only needs doing if you want two wifi signals. The Pepwave router will then select the fastest of the two wifi signals. So far the system is working as described above for the past week. As we get more experience we’ll update you. In the meantime, several more FPB owners have opted for this approach, so eventually we should have a range of experience. And we encourage others to fill in the gaps as there are bound to be more technically astute SetSailors than these humble correspondents. This entry was posted on Wednesday, July 11th, 2012 at 6:53 am and is filed under Cruiser's Tech Talk. Both comments and pings are currently closed. Talk to a guy named Ken Williams with a Nordhavn 68 about internet on a boat. He’s got a blog going at http://www.kensblog.com and seems to have examined all sorts of internet solutions and seems very knowledgable on the topic. I think it was Ken who started John Henrichs (another former Nordhavn owner) down the Pepwave path. As an old email guy, it seems to me that you need a filter on your mail client system that would give you text extracts of all the email manure and thin your bandwidth requirements. Gmail does a fair job of this by default, but when kilobytes from orbit are costing like terabytes at home, “good enough” is probably an order of magnitude lower than even mobile device standard. The are lots of ways of thinning e-mail if that is an issue. SailMail and UUPlus will send just headers if you want, and you can designate that only certain mail is transmitted, and no attachments. When using Iridium, 2400 baud and US$1.50/minute, our substantial e-mail traffic from friends, family, and business, takes less than two minutes a day. But, no attachments, and we ask respondents to eliminate the original text to reduce message size. There are no magic bullets (unfortunately). On our FB150 satcom, we leave the ethernet cable disconnected unless we want to use it and the ethernet cable will only plug in to the Mac in the office of our 64. We have a POE Wifi signal booster with external antenna that functions similarly to yours. That plugs in to an Apple Airport which provides a local wireless network on the boat. The access to control it is thru a URL and is accomplished on our Mac. Finally, we added a cell phone antenna which we are probably going to hook up to an unlocked Ericcson router which can also be connected to the Mac via ethernet cable. So far, we have been using USB stick 3G modems but reception in the office is problematic without the outside antenna. Notice that both the 3G and Satphone will only connect to the Mac – a safety precaution to keep data usage under control on expensive connections. Finally, we have the good old SSB with a Pactor USB modem and Sailmail for text email, weather fax, grib files, et al. The most primitive choice but it always seems to work. How does the cost of your various devices compare to the $1300 for the Pepwave? And, what cell antenna are you using and is it a booster? The MWB WiFi booster was around $500 all up including antenna. The Apple Airport Extreme base station was around $100 (creates the onboard WiFi). The cell antenna is not amplified – just a guess at $100. The SSB set up is expensive – don’t have an exact number but it is probably at least mid 4 figures with the Pactor modem. The USB sim sticks were around 50 Kiwi and another Kiwi 50 for 2 gigs of data. I guess the most direct comparison would be just the Apple Airport against the Pepwave. While on the subject, where did you find it for $1300 – most of the numbers I came up with for the Max HD were over $2000? I like what the Pepwave does but in my setup, it really doesn’t add much additional capability versus what I have. What I really want is just a simple 3G/4G modem that accepts sim cards, has an external antenna connection to connect to the antenna on my mast and a connection to my Mac either via USB or ethernet. It doesn’t even have to be a router (wired or wireless). Maybe one of your readers can steer me on this one. This won’t give me bonding like you have but in most of my travels in NZ or the South Pacific so far, it seems like I get WiFi (paid) in port, 3G in some locations away from port and in many places, nothing. Pepwave has a new model, without the “bonding” feature (and bonding requires another router and VPN). We were told by Pepwave that this is the same as our in all other respects, i.e. the various connections are the same as well as the load management features. But double check with Pepwave (http://www.pepwave.com/products/surf/) to be sure. In regard to your 3G wish have a look at a ” Option Globe Surfer lll”. It has all the features you require and much more. Too many to list intact. There is a big challenge for many of us with an onboard wireless network, satellite broadband service among our communications options wired to the ship’s router, and numerous devices lying around (laptops, iPads, iPhones etc.) That is, the danger of enabling a satellite link for data, then having one or more of the mobile devices pull a hundred e-mails and heaven knows what else onto the device, unbeknownst to us. Giant bills and marital discord on the horizon! I have heard that the Pepwave router can be easily configured to avoid this kind of misadventure, although I don’t know the details. I only know that scouring the boat to switch off wifi on every device before downloading a GRIB file via satellite is probably not going to be effective in our case, plus it’s a pain. The Pepwave router sounds awfully cool, hope the permission scheme you describe lets us keep the convenience of onboard wireless environment without the oops potential. 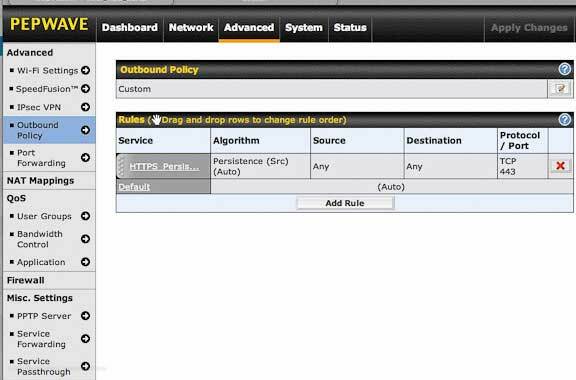 I have not yet done this but the techs say it is easy to create a “rule” with the Pepwave router which says something like “download only e-mails from the following computers” so that perhaps just one computer onboard is enabled for this feature. We still are using Iridium, and this does not connect, but when we upgrade to BGAN or similar next fall, we’ll give this a try. In the meantime the sales/tech guys seem pretty savvy at Pepwave.